Thankfully, sibling rivalry is not a huge issue in my house. My daughters usually get along really well. There's not much squabbling, and they spend most of their free time playing nicely together. Sometimes they are extra kind toward one another, and that just makes my heart melt! It's also something that I want to encourage with frequent praise and acknowledgement. We all know that it is easy to see the bad behavior that our children sometimes exhibit, but it can be much more difficult to see and acknowledge the good behavior! One day several weeks ago I noticed that my 6-year-old, Lena, was being super sweet to her little sister, Maggie. She let Maggie pick the television show that they watched, helped her make her bed, and went along with every pretend play scenario that Maggie came up with. I really wanted to acknowledge her good behavior, so I whipped up a hand drawn "World's Best Sister" certificate for her that afternoon. You should have seen her face when I gave it to her- she absolutely beamed, and I got one of the tightest hugs that I've ever had! Because of the acknowledgement that she received, Lena's more-than-usual kindness towards her sister lasted well into the next day-- she wanted to live up to that certificate! 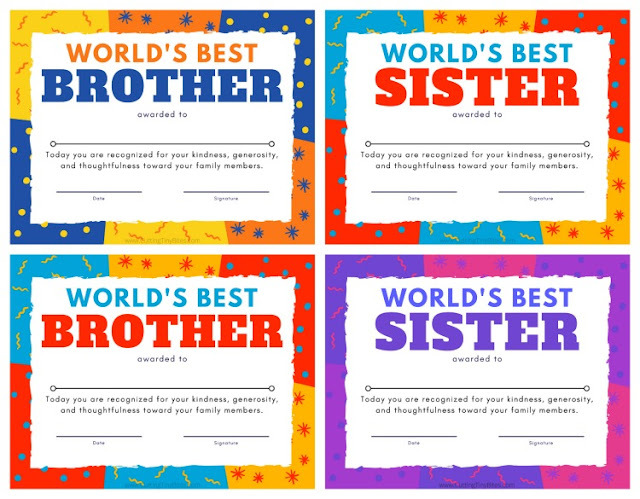 While Lena really loved the "World's Best Sister" certificate that I scrawled for her with Crayola markers, I thought other people might like one a little more professional looking! There are 4 choices for sisters and brothers- just click on the link below for a handy PDF file! Pick the one you like and print in on nice sturdy cardstock so that it won't get torn as your little one proudly totes it around all day. 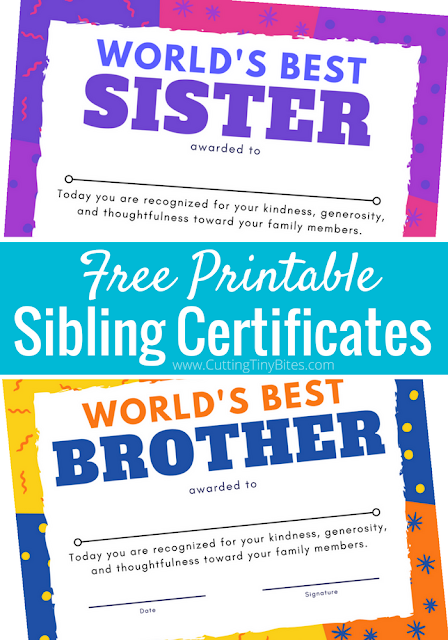 Be on the lookout for the perfect opportunity to award your kids with a World's Best Brother or World's Best Sister award! A "Tip Jar" To Help Siblings Get Along from What Do We Do All Day? 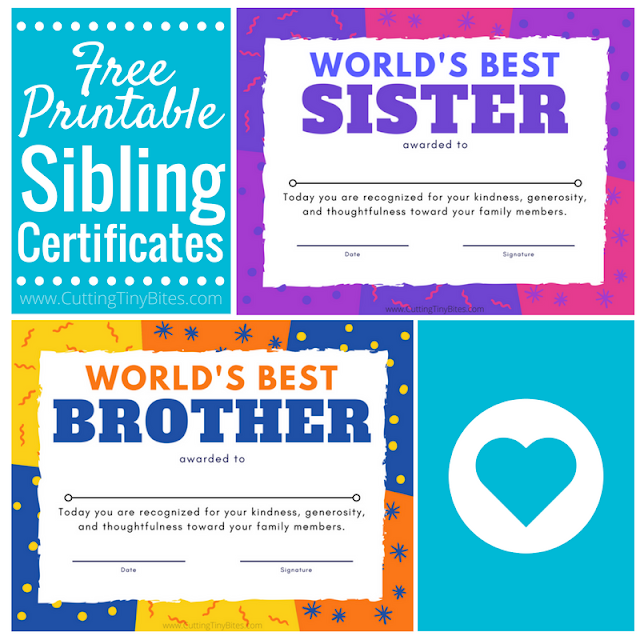 Print one of these bright and colorful sibling certificates to award your to children when they're caught being a World's Best Sister or Brother! Reward good behavior with this positive parenting strategy.